Thousands of years of poor farming and ranching practices—and, especially, modern industrial agriculture—have led to the loss of up to 80 percent of carbon from the world’s soils. That carbon is now floating in the atmosphere, and even if we stopped using fossil fuels today, it would continue warming the planet. In The Soil Will Save Us, journalist and bestselling author Kristin Ohlson makes an elegantly argued, passionate case for "our great green hope"—a way in which we can not only heal the land but also turn atmospheric carbon into beneficial soil carbon—and potentially reverse global warming. 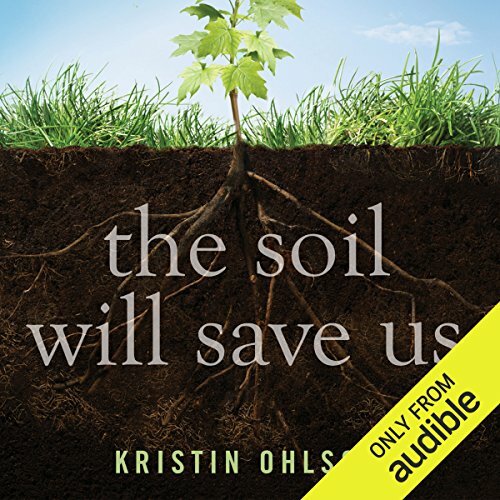 ©2013 Kristin Ohlson (P)2014 Audible, Inc.
What made the experience of listening to The Soil Will Save Us the most enjoyable? Some authors include time-wasting details in order to sound like they are telling a story. The author here includes only those details that help the understanding. Also, I have never heard a better reader-voice. Wow! Direct, highly relevant, and superbly well read. Again, I have never heard a better narrator voice. Where does The Soil Will Save Us rank among all the audiobooks you’ve listened to so far? Definitely in the top half. This book isn't overly technical, but it tells enough stories to help reveal a new understanding of soil. Coming out of an era where conservation means "hands off" or "controlled burns", this book outlines an idea that shouldn't have been so elusive for us... natural systems build healthy (carbon rich) soil. The story gave me enough of an idea of how to build a natural system in my yard, that I built a small garden, and started cultivating natural grass. We'll see how it goes, but the book definitely inspired me to try it. She plays herself well, as narrator. The soil that won the climate war. The book touches on climate change, and the politics on each side of the issue, but really this story is about soil. The more people read this book and act on it, the less disastrous the 21st century will be for us all. Perhaps titling the book more accurately would have helped. To me it was summaries of people like Gabe Brown’s writings, silly descriptions of the many conferences and farms she attended, historical and political references. My expectations were for an in depth, useful, pragmatic treatment of the subject of the soil. I found little to inspire the application of useful information (there was little supplied) to my own cultivation of the soil on my land. This book functions as an elegant and exceptionally persuasive argument for completely rethinking our relationship with the earth and how we grow what we need to exist. Bravo! I learned a great deal and changed my life as a result. This book made me smile and stuff! Enjoyed the scientific review and feeling optimistic about climate change, narrarator was dry and cannot pronounce place names or some science terms correctly. If you could sum up The Soil Will Save Us in three words, what would they be? This author writes about carbon sequestration and climate change in a a logical and easy to understand way. The scientific explanations provided are both accurate and surprisingly (for a non-science writer) thorough. The Soill Will Save Us should be required reading for high school students and freshman science majors. It's also great for those starting to learn about climate change too. And for the more advanced, this book is a great instructional tool for students, as well as vindication to know that the message is tricking out to non-scientists. Ohlson does a great job presenting complex ideas - making it easy to digest for us all. An important message of hope. Would you listen to The Soil Will Save Us again? Why? Lots of interesting material and insights. The accents are terrible! The narrator tries to imitate an indian which I find distracting because it is so poorly done. Also she tries to imitate Australian ones which insulted me!!!! Some very interesting information and great to learn that the ability to heal our planet is indeed in the very substance that made us, the earth. The book gets more interesting, and the content more substantial, the further in you get. I listened at about 1.5x.